Inkubus Sukkubus formed in the summer of 1989 when Tony McKormack, Candia Ridley and Adam Henderson met at college studying graphic design. 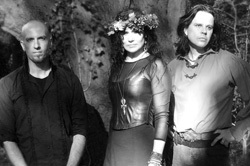 They shared an interest in paganism, witchcraft and vampirism as well as making original music from an early age, and so the type of band that was to emerge from the joining of forces was, quite naturally, an expression of this. Initially the band was called Incubus Succubus. The original aim of the band was (as it still is today) to be the vehicle in which the celebration of the Pagan experience could be conveyed. After being in existence for about a year the band released their first single, Beltaine, which received Radio 1 and regional airplay. However, shortly after this some members of the band drifted away leaving just Candia & Tony. The couple, however, continued in the form of Children of the Moon, a studio-based project in much the same vein as Incubus Succubus. Their material was very well received by the growing Pagan underground scene. In December 1991 Bob, the original for Incubus Succubus. drummer, rejoined Candia & Tony, and Incubus Succubus was consequently reborn. The band played around Gloucestershire, Bristol and Oxford, and released all of the Children of the Moon material on one cassette album called Beltaine. In 1992 the band recorded the album Belladonna & Aconite which was released in October. By this time Incubus Succubus were being hailed as `Britain's Premier Pagan Rock band'. 1993 brought offers from independent record companies, which resulted in the release of Belladonna & Aconite on CD in October, and the Wytches CD in April 1994 on Pagan Records. During 1993 the band toured twice with Nosferatu, and became regulars at the Marquee in London and Nottingham's Rock City. The band's following grew and so did their fame. They appeared on the BBC World Service and in several European, American and Far Eastern magazines. In 1994 they recorded the EP Corn King, did two headline UK tours, played Paris and also supported the likes of The Damned, Zodiac Mindwarp, Clawfinger, Patricia Morrison and The Marionettes. In 1995 Incubus Succubus played alongside The Mission, Genitorturers and Danzig at two prestigious German festivals. By this time they had also appeared on many compilation Gothic CDs including What Sweet Music... I & II released by Thee Vampire Guild, Dreams in the Witch House released by Grave News, Touched by the Hand of Goth from Euromedia and Jungle's Gothic Rock 2. In 1995 they signed to Resurrection Records and released the much-awaited album Heartbeat of the Earth at the end of October. The album was promoted with a successful tour where the new material was welcomed with enthusiasm. In the spring of `95 it was decided that the spelling of the band's name would change to Inkubus Sukkubus for numerological reasons, and with this came other notable changes. The live band went through a stunning metamorphosis and they now play with a drum machine and full programmed orchestral backing from sequencers giving the richness and diversity of sound and emotion previously found only in the recorded band. Bob returned to his first instrument and began to play bass guitar for Inkubus Sukkubus, and the distinctive celtic bodhran was maintained as an integral part of the live as well as recorded I.S. In March 1996 Inkubus Sukkubus appeared on the popular British nationwide television programme, The Big Breakfast and were filmed playing live by The Girlie Show, another nationwide quirky youth show! In May/June 1996 I.S. did a very successful tour of Germany - including a return trip to Paris - so winning over a new army of followers. They returned to Germany as well as playing for the first time in Belgium in the Autumn of 1996. Also in 1996, by popular demand, the band's first album, Beltaine, was released on CD for the first time through Resurrection Records. On 23rd November 1996 Inkubus Sukkubus were invited to perform at the Pagan Federation's 25th Anniversary Annual Conference. The day was a great success, and the band rounded it off by playing to an enthusiastic spiral dancing crowd. During 1996 Adam Henderson rejoined the band as bass guitarist. 1997 brought more appearances on compilation CDs including the 3rd and final Vampire Guild release, What Sweet Music... R.I.P. with their track Vampyre Erotica; the CD to accompany Mick Mercer's new book, The Hex Files with the track Heart of Lilith; a 4 CD compilation (Cleopatra Records) called The Goth Box; and a cover version of Spellbound on a Siouxsie & the Banshees tribute CD also on Cleopatra. On 24th August 1997, six weeks after the birth of Tony and Candia's baby boy Leon, the band headlined a major convention at the Hippodrome in London - Vampyria - featuring many well-known horror authors as well as stars from the world of Hammer to over 1000 enthusiastic fans. The band released their fifth album, Vampyre Erotica, exploring wilder as well as more sombre and haunting moods. It was released 22nd September 1997 and was promoted by a series of UK dates including headlining the now-famous Whitby Gothic Weekend on Hallowe'en. 1998 proved to be a very exciting year for Inkubus Sukkubus. In February they headlined The Bank in Manhattan, New York promoted by Sabretooth Inc. to a capacity audience. They returned to Belgium in the spring, and during the summer they headlined a major festival held in a medieval castle in the Polish mountains. They also headlined the annual Sacrosanct festival in London. September 1998 found the band performing at Vampyria II which was held at the Camden Palace in London to a capacity crowd of around 1600 people, shortly followed by Symphony of Shadows Festival at Whitby, N. Yorkshire (home of Bram Stoker's Dracula). Inkubus were also invited back to play the Annual Pagan Federation Conference on 21st November where around 1700 pagans attended from all over the world. They also returned to the U.S. at the end of October to tour, culminating in a show in New Orleans on Hallowe'en. The CD entitled Away with the Faeries, was previewed at Vampyria II, and was available on general release in November. The recording was a limited edition album featuring 6 new studio tracks along with 9 live tracks recorded recently in the band's home town of Cheltenham. In 1999 Inkubus Sukkubus toured Germany, France Belgium, America, as well as the UK. They also released the album entitled ' Wild'. They continued to consolidate their position as the world's biggest and most popular Pagan Rock band and launched their domain site, www.inkubussukkubus.com. During 2000 Inkubus Sukkubus toured the UK and Germany and Inkubus Sukkubus headlined the Whitby Gothic Festival (now the biggest Gothic Festival in the World). The band wrote and recorded their 8th album, 'Supernature', and also played Greece and France. The year was seen out headlining a celebratory Yule festival in Chicago, USA. 2001 saw Inkubus Sukkubus go from strength to strength. They appeared three times on Channel 4 television this year, and also released their eighth album 'Supernature' on vinyl and CD (with CD-ROM section). The band toured the UK and headlined the Gotham Festival in London. They also headlined the Reading Goth Festival, and supported Marilyn Manson on the mainstage at the M'era Luna Festival to an audience of over 24,000. The year also saw Inkubus Sukkubus make major intrusions into cyberspace; in the first six months or so, their MP3 site www.mp3.com/inkubussukkubus had over 400,000 downloads. The Band finished of the year by playing the 10th Anniversary of the Return of the Dead festival in Hamburg, and a couple of gigs in an unexpectedly snowy, yet still welcoming, Italy. 2002 saw the band increase their profile on the Internet becoming the most downloaded Goth band in the world. They also re-released the WYTCHES album and continued to play Europe and the UK. During 2003 The band have released their 9th album "The Beast with Two Backs" on October 31st . The Band also played Belgium, Portugal, Sweden, Norway, UK and Germany, Including the Wave Gotik Treffen in Liepzig. They played The Black Elben Festival - Dortmund, and Headlined the Whitby Goth Festival with Wayne Hussey and All About Eve, aswell as Playing The Witchfest Festival in London with the Medieval Baebes. The Band have also went on to be the most downloaded UK band on MP3.COM with 1,500,000+ downloads. During 2004 Inkubus Sukkubus Headlined the Gotham Festival in London and played a charity gig at the Gloucester Guildhall. The band also wrote most of the tracks for the next album that will be released in 2005. The Band were also active on Soundclick maintaining the number one position in the Goth Rock chart for almost the entire year. In 2005 Inkubus Sukkubus played a series of dates in the UK , Sweden, Norway and Denmark, Russia and Australia, they also released their tenth album, called "Witchqueen". In 2006 Inkubus Sukkubus continued playing across Europe with gigs in the UK, Portugal, Turkey and Germany, they also made two videos for Church of Madness and Wytches, as well as an unreleased one for Vampire Erotica, Tony McKormack also made five videos with his side project Vampire Division. In 2007 the band played more live dates in the UK and Europe and released the Album Science and Nature. 2008, and Inkubus Sukkubus began playing the UK with their new animated video backdrop, produced by band guitarist Tony McKormack .The band have also released the album Viva la Muerte (vavailable only from their wesite). In 2009 Inkubus Sukkubus celebrated their 20th Anniversary . With 13 albums relesed to date, hundereds of gigs played and millions of internet downloads they have so far had a long and productive career.During 2009 they played several dates including Finland, Lithuaniaina, Germanyand Mexico. The actually performed tracks from the their newly released Mexican themed Album, "Viva la Muerte" on The Mexican Day of the Dead in Mexico City. The also played several gigs performing acoustic versions of their popular tracks. They are currently writting new material for a future release. In 2010 Inkubus Sukkubus released, Viva la Muerte internationally. Inkubus Sukkubus also had the track Death Comes available to download and play in the video game Rock Band, here . And four more tracks were released in this format throughout the year. 2010 also saw Bob Gardener return to the band as bass guitaris, and the re-release of the WYTCHES album as a special edition digi pack using artwork based on the original concept dating back to 1993. Inkubus Sukkubus also released the Dark Goddess Album, which is considered by some to be their greatest work. The album was initially only available for sale from their website. 2011 The Dark Goddess album has been repressed, and was released internationally in February, The band's first CD album Belladonna & Aconite was also digitally re-mastered and relesed in April) They contiued playing live and recorded another album entitled "The Goat" , which was initially available from their website and was on international release in February 2012. The Vampire Division (Tony McKormack's solo project) , Album, The Dead Unleashed was also released on October 31st. 2012 saw INKUBUS SUKKUBUS continue to play live in the UK and Europe. The Goat album was re-pressed earlier in the year and the band are currently recorded a new album which it is hoped to be released before the end of the year. During this year the band have also been working on the acoustic set that they sometimes play, with the incorperation of different songs. There are also plans to gradually release digitally remastered versions of all of the out of print albums. 2013 There are already several interesting developments this year for Inkubus Sukkubus. The forthcoming release of a double anthology album in the USA on Cleopatra Records, and the Release of Queen of Heaven, Queen of Hell their 16th Album. Inkubus Sukkubus havealso played Belgium and Germany, and are due for an appearance at the Bram Stocker film festival in Whitby. During 2013 the band will also played several Fairey Festivals and began remixing some of the all time favorite tracks, into new and interesting versions. The band are currently looking forward to their 25 year aniversary in 2014. In March of 2014 Inkubus Sukkubus releaed their 18th Album entitled "Love Poltergeist", which has so far proven highly popular and has to date out sold all of their recent albums, those released since the advent of filesharing. The band are planning to play several times throughout the year, in the UK, Europe and Central and South America. In May 2014 Inkubus Sukkubus was joined by Bassist Dave Saunders, who replaced Bob Gardener, who had to leave due to family comitments. Inkubus Sukkubus are currently working on new material.